As many of you know Gus and I had quite an interesting weekend. A weekend that included sun, snow, ice, wind, fire, rain, and over 30 backcountry miles logged on myself, and my dog’s legs. A true reminder that when one ventures into remote and wild places, sometimes mother nature has other plans and natural course, takes natural course. With Jeneé taking a long weekend back to Michigan to visit her family, Gus and I decided to spend a quick one night out-n-back backpack trip deep into Three Sisters Wilderness west of Bend. I chose Camp Lake, a really high alpine lake set between the massive sleeping giants, South and Middle Sister mountains where we could find stunning views and virtual solitude. I didn’t need to wait for my alarm because I was already rolling around and mostly wide awake in the back of the Highlander. Outside the window towered 11,239 foot Mt. Hood glaciers glowing in the 11:45PM moonlight. I knuckled what little sleep I had in my eyes, for I had spent the last 3.5 hours laying down with my mind racing. I was really too excited for my climb to really get any sleep and I had to remind myself that in order to sleep, I was going to need to close my eyes. I geared up in the darkness of the parking lot, and I could hear other climbers rousing from their cars, with the tink-tink of climbing harnesses and carabiners as they got ready. I had heard the legends of Gitche Gumme’s bi-polar behavior in the past, some of which was dutifully chronicled in Gordon Lightfoot’s song “The Wreck of the Edmund Fitzgerald” about the Lake Superior freighter that disappeared and sunk in a nasty gale in the 70’s, but the true magnitude of the lake had escaped me. The sheer size of Superior was what amazed me most, and the fact that we were planning on spending four days camping her shoreline seemed a daunting task (see all pictures HERE), as I stared north towards Canada, but saw nothing but aqua-blue 40 degree water. 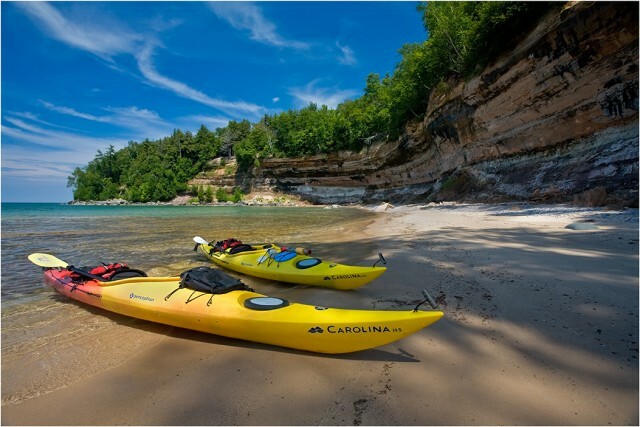 Neé and I had decided as a final Michigan sendoff, we would sea-kayak Pictured Rocks National Lakeshore, and spend time at Grand Island as well. Being mid-May, we expected not to run into any crowds, and this assumption proved to be correct. Our guide Carl from Northern Waters Paddling assured us he was doubtful that the DNR had even been over to Grand Island to clear deadwood, or ready it for the summer season. He was right. After arriving in Munising, MI after a 6 hour car ride north, we were greeted by Carl at his kayak shop right on the shores of Superior. We were fortunate to have his attention to safety detail, and I reminded myself of this as he took us through our 7-hour safety course in order to venture onto Gitchee Gumme by ourselves. “I would rather have you feel what 39 degree water feels like for real, rather than going to some warm inland lake to practice rescues…You are less likely to take chances out there once she takes your breath away,” Carl told me. He was a grizled Superior local who saw her mood swings, and saw rookies like us get into some pretty hairy situations, some life-threatening. After 4 hrs of classroomm instruction that included weather, waves, gear, and emergency techniques we were finally paddling. The gin-clear water of Munising Bay seemed like childsplay compared to the 1000 foot deep, 40 degree waters that lie offshore. We practiced paddle strokes, and even in-water rescues. Jeneé and I were shocked at the detail of the tandem, and self rescues, but it was great information, and experience to have! 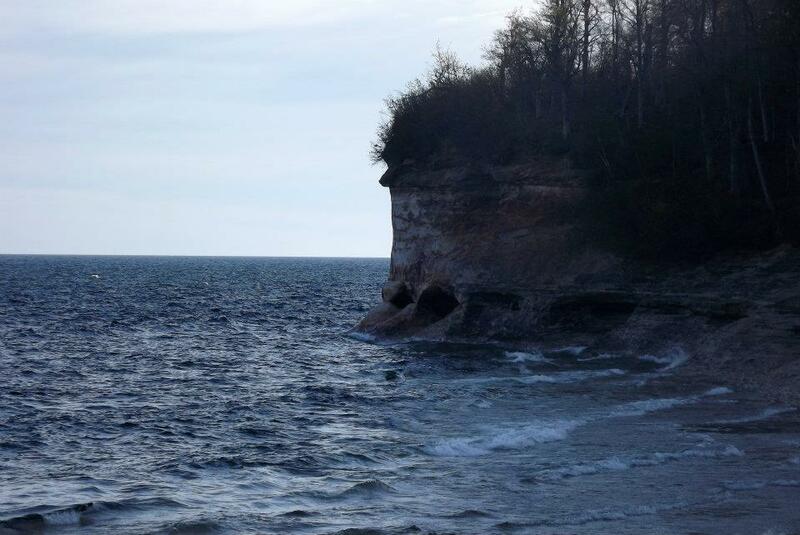 We spent the afternoon on the water, and it was too late in the evening to paddle the shore to find a camping spot, so we decided to backpack in a couple miles and camp atop the massive cliffs of Pictured Rocks. 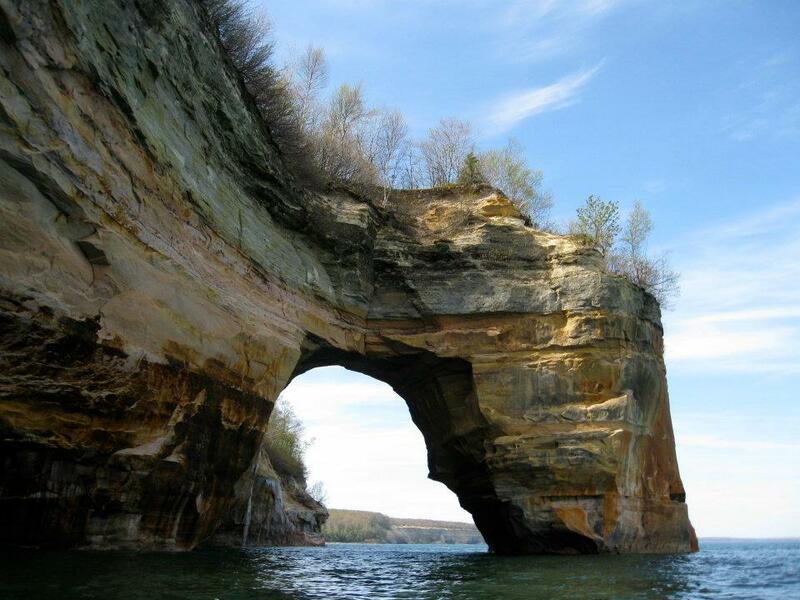 Pictured Rocks is visual proof of the Great Lakes glaciated past, and her 500-million year old sandstone is painted with various mineral shades that jut up 250 feet off the surface of the lake for 20 miles on the north borders of the Upper Peninsula. Truly one of the most incredible places I have even seen in the natural world. We were able to set camp near Miners Castle, on a 200 foot bluff looking back towards Munising and enjoyed an evening completely alone under the massive canopy’s of deciduous tree cover. After an early start and some camp coffee, we loaded the kayaks and shoved off from Miners Castle Beach planning to paddle along the rocks to Mosquito River Beach. I am not kidding when I say we were the ONLY people on the water. 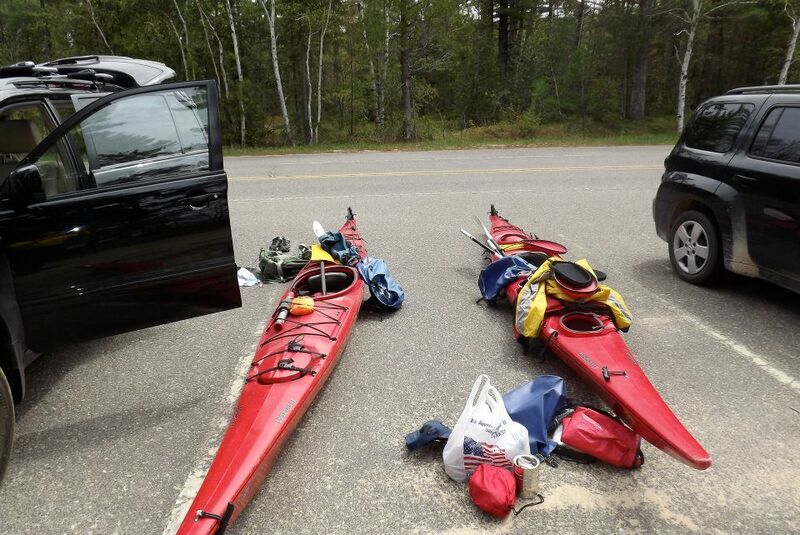 As a matter of fact; we only saw 2 other kayaks the entire weekend, and one fishing boat way off in the distance. True solitude. That’s Pure Michigan (I had to say it). 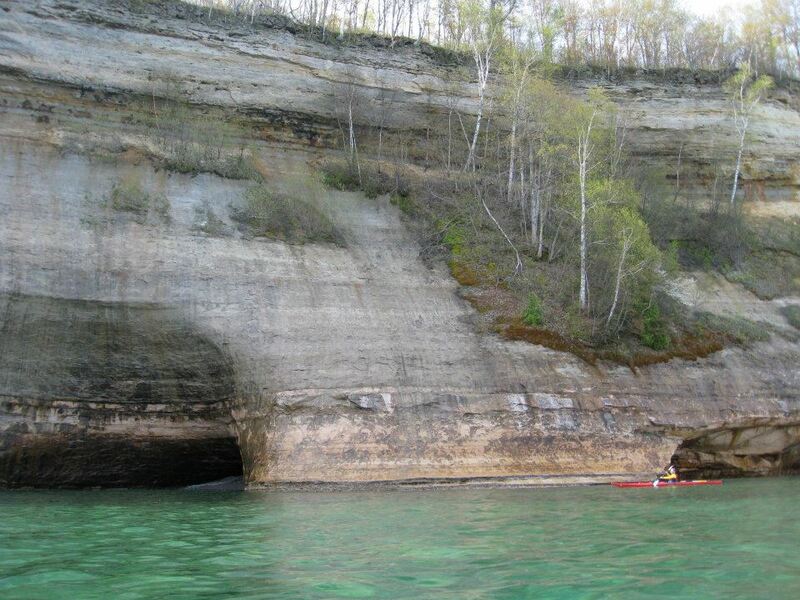 The sheer magnitude of the Pictured Rocks was in full force, and we had pond water calm lake surface to make the 4.5 mile paddle east. It was amazing to see the various rust colored layers, and random waterfalls sprung from the sandstone rock faces. Reaching Mosquito River and it’s campground, we had some lunch and decided that this was where we wanted to stay the night. Only problem was our gear was back at Miner’s Castle Beach. The trip east was smooth sailing, but by afternoon, a steady 15 knot west wind had developed along with steady 2 foot swells. This made the trip back along the rocks anything but scenic, and it turned into quite the workout as we slogged back to Miners. Deciding that Mosquito River was where we wanted to sleep, we shouldered our packs, and actually hiked 2.5 miles back into the park. The trail was woven amongst huge stands of old-growth and huge deciduous trees. We chose a site up on a bluff overlooking the lake, and by then we were ready for a drink, and some sleep. We wandered the beach taking in the changing weather, then huddled down in our tent as a Lake Superior storm bore down and churned the lake into a frenzy. The next morning, not wanting to tempt fate, we hiked out and drove back to Munising to wait out the weather and let the seas subside. 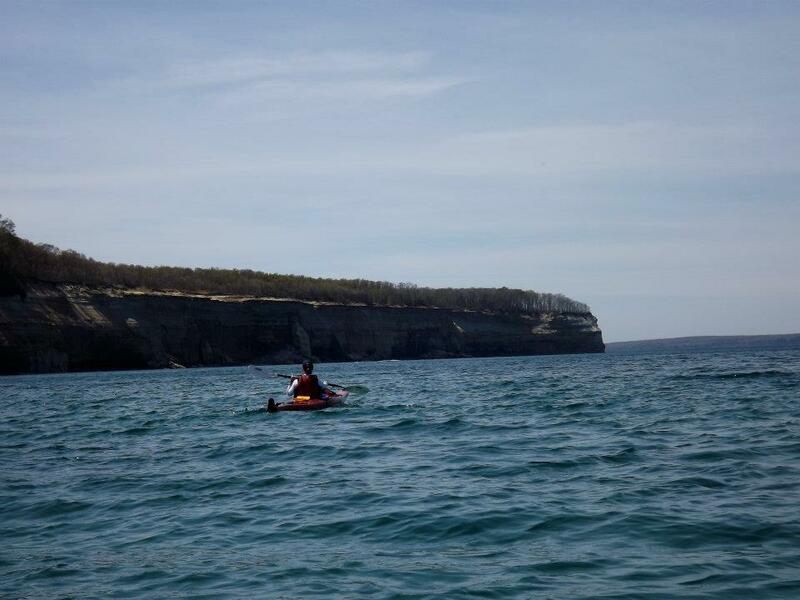 Our next move was to paddle across the channel to Grand Island, an 14,000 acre uninhabited island off the coast of the U.P just north of the town of Munising. Leaving Sand Point, we paddled the channel, then gained our security by hugging the rugged shoreline of Grand Island and stayed out of the wind and swell. 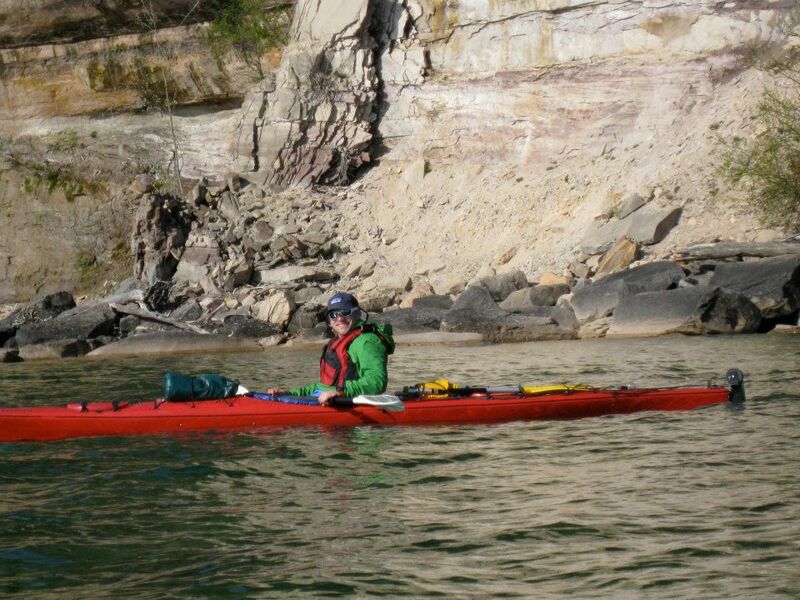 The 5 mile paddle forced us around the thumb of the island and back into pristine Trout Bay. 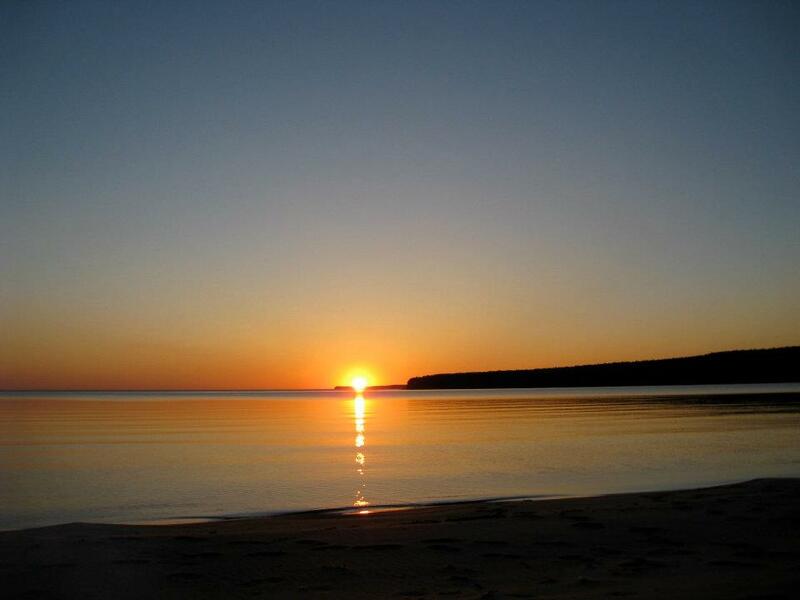 When we landed on the sands of Trout Bay, I was convinced we were the first people to be on the island in 2012. Not a track or sign of a person for miles! Neé took a nap on the beach, and I set camp for the night really enjoying the solitude. 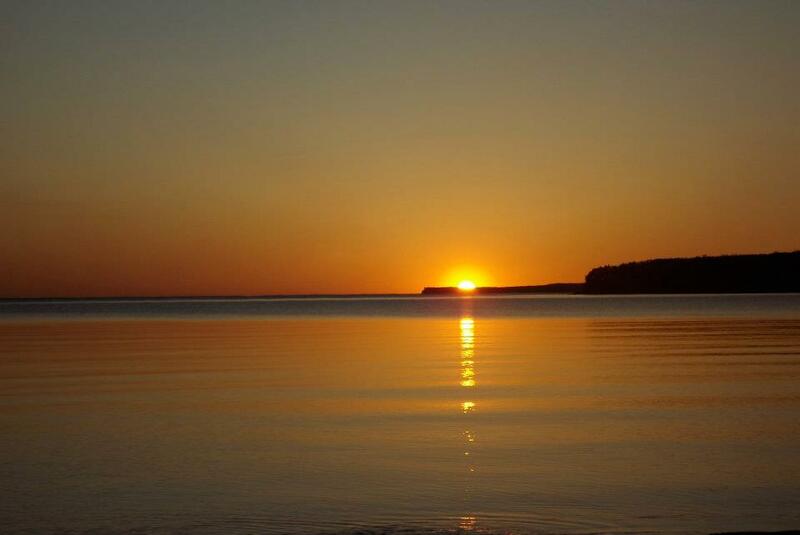 If I could do it over again, I would probably spend two nights in Trout Bay because the solitude is hard to beat, and the views of Pictured Rocks 20 miles to the east are breathtaking! A roaring fire and a belly of chili made the 5 mile paddle weigh heavy, and both of us were asleep barely after sundown. The highlight of the trip came at 6:25 AM the next morning when we were able to watch sunrise over the Pictured Rocks, while sipping coffee on the beach! We had not seen a person for two days, and the wild feeling of where we were really sank in! Such a beautiful place, that so many people in the Midwest, let alone Michigan barely ever experience. Here is a brief slideshow of a few pictures, but click the link at the beginning to check out all the pictures! Filed under Backpack, Gear, Kayak, M.O.A.B. 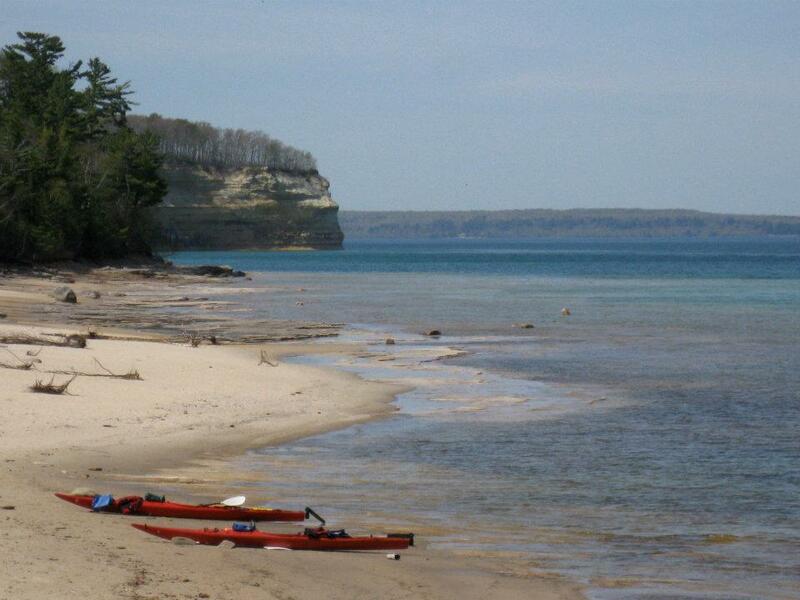 Tagged with backpacking, Hiking, Kayaking, Lake Superior, Midwest, Munising, Pictured Rocks, Sea Kayak, U.P. Sorry for the delay! There has been a ton of things going on including gradution and preparations to move to Bend, Oregon. The Midwest Outdoor Blog will be going through some changes in the coming weeks, but stay tuned! We are headed to Grand Island in Lake Superior (Gitche Gumee) for some kayaking and backpacking fun as part of a midwest “Bucket List”. 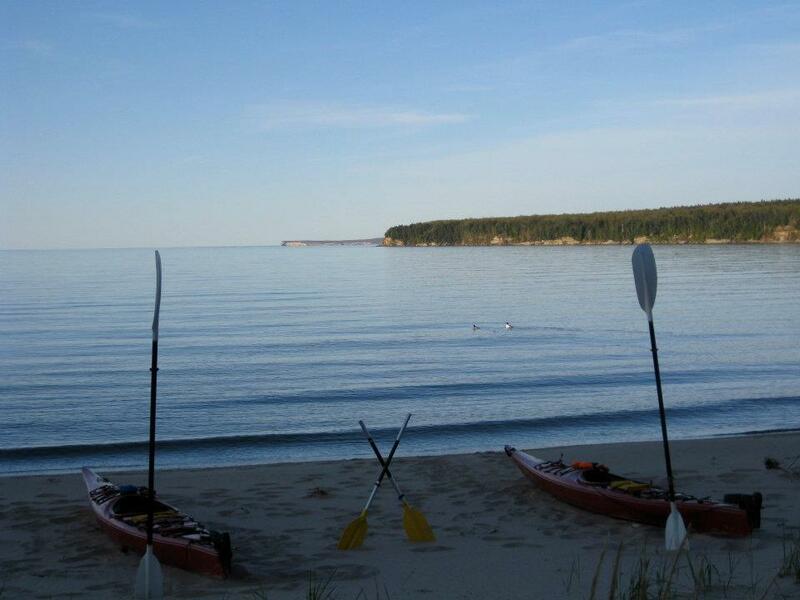 We will be some of the earliest campers/ paddlers on Grand Island’s shores, and the 40 degree water will be sure to make us feel fairly “puny”. 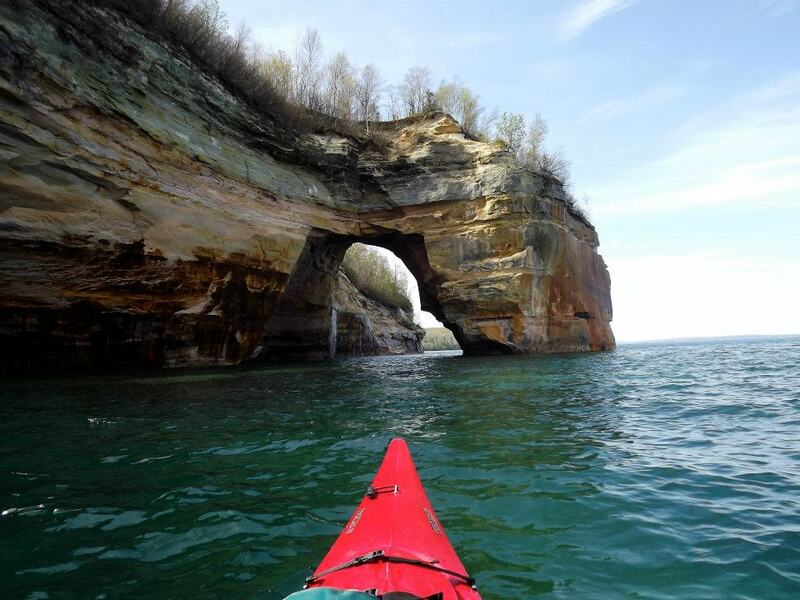 The plan is to take an open water kayaking course on Thursday, then tour the dramatic cliffs of Pictured Rocks National Lakeshore that same afternoon. 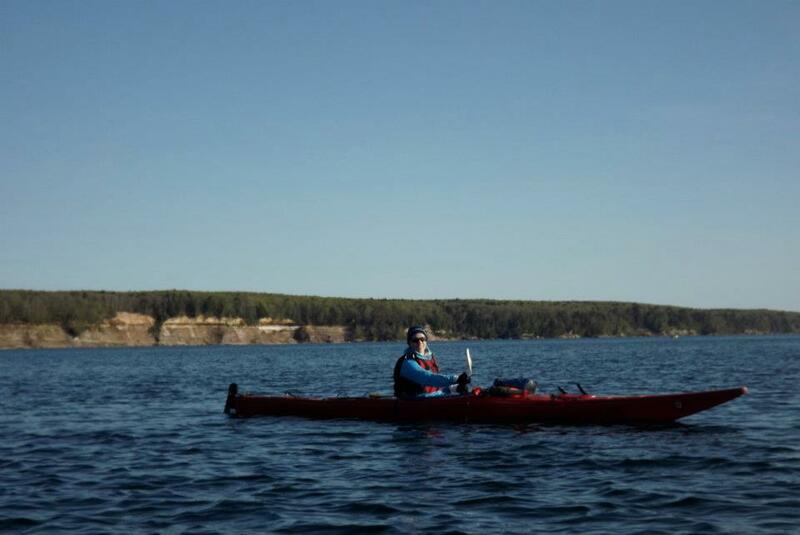 On Friday we will paddle across the channel to the island and spend the next two nights beach camping on the shore of Trout Bay in Lake Superior. I will give a full update when we get back! All Outfitters – One Stop Adventure Vaca Shop! In our frenetic daily lives people want streamlined, organized, and easy to digest information right now, and at their fingertips. Consider the stats: 1 BILLION Google searches each day, and 41.6 MILLION searches an hour mean people have become used to finding the answer or resource they are searching for in a matter of seconds. We are spoiled in that way. Seriously, why waste time searching 15 sites? Imagine a website that acts as a search engine for outdoor hunting and adventure based trips? Meet AllOutfitters.com. A comprehensive website launched in 2012 by two Midwestern brothers features the ultimate resource for hunting, fishing, wingshooting, and adventure outfitters. The complete resources of the website puts guides, lodges, and charters throughout North America literally at your fingertips, and would make Larry Csonka’s head spin. AllOutfitters.com is the world’s largest online adventure directory featuring 15,000+ listings and counting, and doesn’t plan on stopping soon. The beauty of it is in the “social” aspect of it. All lodges/outfitters can have a listed profile, and just like Google, if you pay you will get “featured listing” status. Either way the connection to the information you need to make decisions is packaged up in front of you. What I love the most is the ease of use, and often times websites miss the mark on simple, streamlined flow, and what users expect from their visit. Lately we have been shopping for a car, and sites like cars.com or vehix.com make the car shopping and research process a breeze. AllOutfitters takes this same concept in their easy browse and search functions called “Build A Trip”. Each trip selection that you choose based on sport and location will only display choices from your specific search and preferences of location and trip! You pick what you want, and the options come to you. How Google of them?! So whether you are wanting to knock down a Moose in ‘da Yukon, or slay some Marlin in the Caribbean while sipping a Landshark it’s all right here. Results are presented with everything you need and all of their information listed (location, accomodations, methods, equipment, guides, seasons, limits, trip durations, prices, travel, weather, and what to bring). Also, they upload photo galleries as well as field reports which keep people up to date with anything they want, such as “check out this 50 inch muskie caught today, what a brute!”, or “limit of pheasant shot before 10 am” or maybe just to post daily fishing reports… whatever they want, and it’s all there.